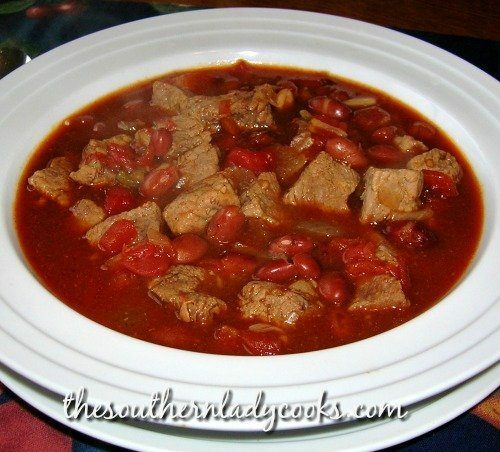 This Crock Pot Santa Fe Stew is a great recipe. We love it. The recipe makes a lot and I serve it two different ways. Your family and guests will surely like this one. Serve with my Southern hoecakes shown in the photo. This Santa Fe Stew keeps well refrigerated for several days. You could also freeze it or cut the recipe in half. 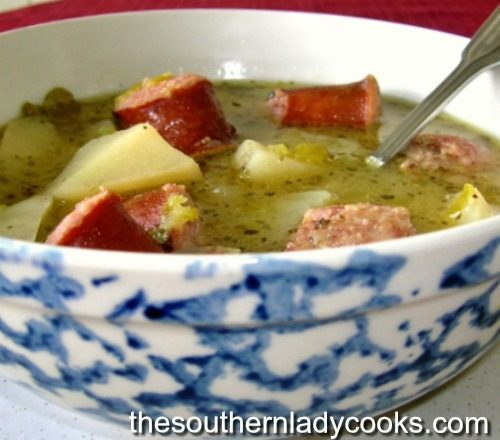 Santa Fe Stew is easy and delicious made in the crock pot. Brown ground beef with onion, green pepper and spices in a skillet on top of the stove. Add all ingredients to crockpot and mix in ground beef mixture. Cook on low 2 to 3 hours. This makes a 3 quart crock pot almost full to the top, approximately 10 to 12 servings. 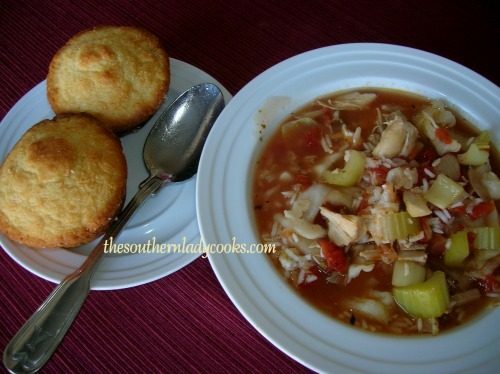 It is great served with cornbread. Note: I always have leftovers with this stew. The second day we eat it in tortillas with sour cream, salsa, and shredded cheese on top and love it this way, too. This stew is wonderful on a cold day. Throw everything in the crock pot and enjoy a wonderful dinner when you get home. Great with cornbread. I always have leftovers with this stew. The second day we eat it in tortillas with sour cream, salsa, and shredded cheese on top and love it this way, too. You will be able to “share” these by looking below and clicking on Facebook, Twitter or Pinterest to share with your friends. Click on the picture of the little printer below if you want to print. Delicious recipe! Thanks so much for sharing it. To keep tummies happy in my home, I added extra corn–a can of Mexicorn, celery, extra garlic, and stewed tomatoes. I didn’t have plain pinto beans, so I added a can of “S &W” (I think) pinto beans with chili seasoning, etc. Yummy! I’m so glad you enjoyed this soup Jan! Thank you for the kind comment about our website. It’s people like you that makes the hard work worth it! Have a wonderful Sunday. 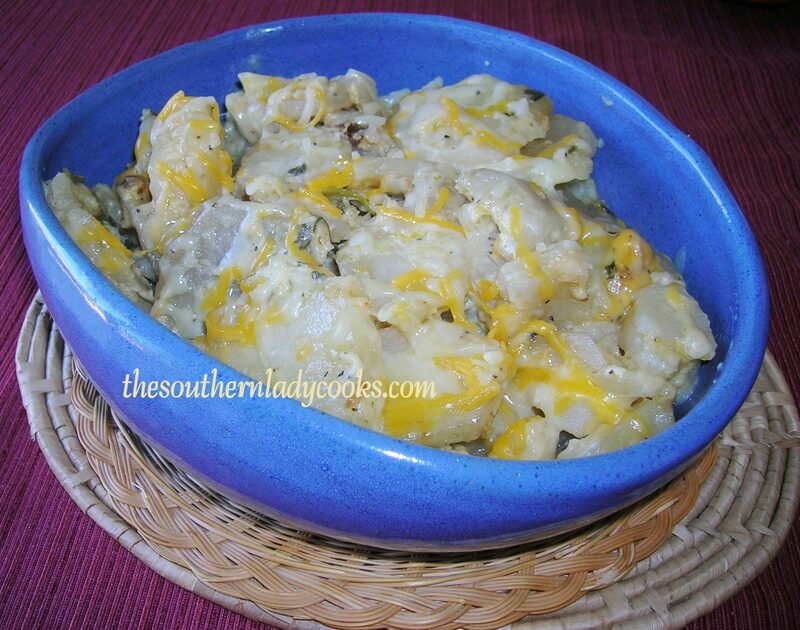 I really like this recipe, have been using for years…BUT…we like it served over Frito’s with grated cheddar cheese on top. It’s perfect on a cold wintery day. Delicious!! Thank you for sharing, this recipe is DEFINITELY a keeper! I doubled the recipe and it filled my 6 quart crockpot. It goes very well with saltine crackers! Any suggestions for cook time in Instant Pot, rather than Slow Cooker? Hello Jill, I have no idea since I have never used an Instant Pot. So sorry. When you say small green pepper! I know a lot of peppers that’s green! We have this all the time. the guys love it and there is plenty for lunch the next day. It does not freeze well ( not for us) but still make it atleast once a month. I made this stew last week for a girls trip in the mountains. It was easy and good, but next time I plan to add two packages of Taco Seasoning mix, and Rotel tomatoes, to make it a little spicier. Where is the recipe for the corn bread? I had saved this recipe when you posted it on your Facebook page. Finally tried it today–definitely a keeper! I tried this recipe for some friends at a dinner party. It went over well. I doubled the recipe, and had just enough left over for breakfast the next morning. Made this today with the following changes: I don’t care for Pinto Beans, so I substituted Chili Beans instead. I also used a spicy ranch dressing seasoning mix, and I added some prepackaged cubed butternut squash. I thought I might have to add broth or stock but as it turns out, there was plenty of liquid, and the stew tasted great! I’ll be making this one more often throughout this winter!!! Made this for dinner tonight! It was a big hit with my family! We have made this for years only we call Taco Soup. I put just a little heat to it also using Pennacook Purely Pepper Powder….served with sour cream, cheese….I always make a pan of cornbread….I have used several of your recipes and they are wonderful. It is hoecakes. I added the link to the recipe. Just click on Southern hoecakes at the top of the recipe. I checked her recipe to see if it was the same. I had never seen hers before. They are similar but this is not the same recipe. This looks so very good! This is Next Weekends Dinnner!!!! Now that’s a hearty stew and I like the idea or repurposing it the next day!